System Doctor 2014 is a rogue anti-spyware program from the Rogue.WinWebSec family of computer infections. This program is classified as a rogue because it pretends to be an anti-virus program, but will instead displays fake scan results, fake infection alerts, and does not allow you to run your normal applications. This program is distributed through hacked web sites that exploit vulnerabilities on your computer and as Trojans disguised as a program that is necessary to view an online video. 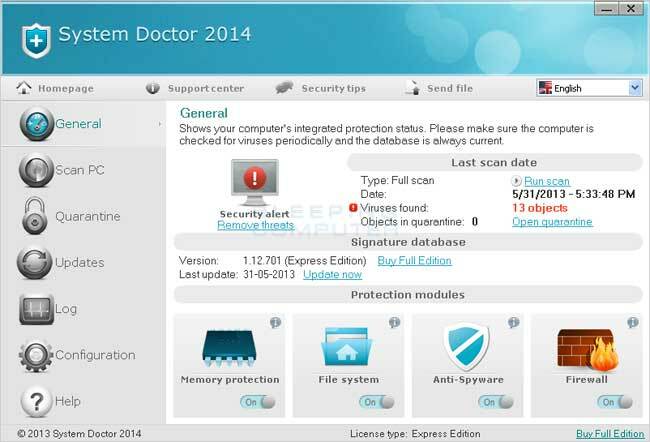 When System Doctor 2014 is installed it will be configured to automatically start when you login to Windows. When it starts it will automatically perform a scan of your computer and falsely state that it is infected with a variety of computer infections. If you try to clean these infections, though, System Doctor 2014 will state that you first need to purchase a license of the program before you will be allowed to do so. As all of the scan results displayed by this program are false, please ignore any prompts to purchase the program. For more screen shots of this infection – click on the image above and you will be taken to the Removal page at BleepingComputer to see all four screenshots of System Doctor 2014 and the important removal instructions!